Whether you have a cellist, a bassoonist, a jazz drummer or operatic tenor, serious musicians look for undergraduate and grad schools with top-notch music programs. And just as universities are divided into tiers, with the Berkeley and Yales of the world at the top, and less competitive schools lower down, the stratification of music schools is even more extreme, with the best conservatories in the country nestled at the top of the pyramid. But for many musicians, the better fit is a conservatory on a college campus​ or a university with a top-ranked music department. Like a conservatory, the best of these music schools require auditions, concert and recital resumes and a very different application process from the typical college admissions experience. The key lies in finding a music school that fits the musician's skills, commitment, and passion. Every major university has a music program, but the colleges on the following pages represent some of the best music programs in the East. Turn the page to get started, or use the quick links below. 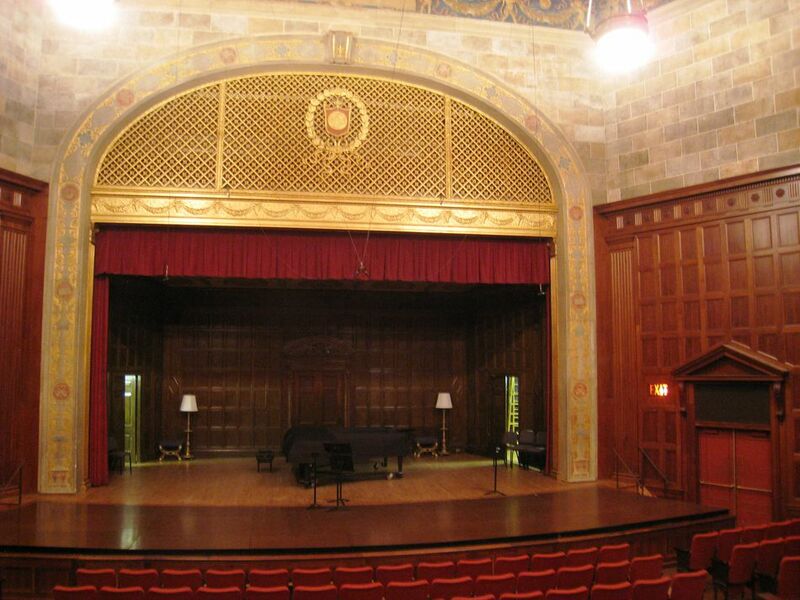 Eastman School of Music: This prestigious, 80-year-old conservatory at the University of Rochester in New York offers both undergraduate and graduate degrees to its 900 students. Several Pulitzer Prize and Grammy winners have been members of the conservatory's full-time faculty, and the list of illustrious alumni include soprano Renée Fleming, Boston Symphony managing director Mark Volpe, and a long list of classical and jazz greats. Getting in is the challenge - some 2,100 musicians apply each year for about 280 spots - and kids who apply here also generally apply to the major conservatories. A dual degree requires admission to the University of Rochester as well as Eastman, but if your musician is pursuing a bachelor of music degree, he can apply to Eastman directly, via the Unified Conservatory Application and its attachments. NYU's Steinhardt and Tisch School of the Arts: Classical and jazz musicians will want to check out NYU - New York University in Manhattan - and its renowned music department, while musicians interested in musical theater, film, television and the recording arts will want to explore the Tisch School of the Arts, which includes the Clive Davis Department of Recorded Music. Admission at this private university is highly competitive and requires stellar GPA and test scores as well as auditions. Peabody Institute of Music: Founded in 1857, this renowned music conservatory is part of Johns Hopkins University in Baltimore, Maryland. Liberal arts coursework is required, but students who want to take math and science classes can cross-register at Johns Hopkins across town. Peabody offers both undergrad and graduate degrees, and admission is highly competitive - students are auditioning against some of the most talented and passionate musicians not just in the U.S. but the world. That said, once a musician gets in, he'll find a nurturing, not cut-throat environment. Yale School of Music: You'll find high-level music departments at all the Ivy League schools, but Yale's program is noteworthy as a niche school, a good fit for a very specific subset of scholarly musicians. Undergraduates can pursue a music degree or join one of the university's many ensembles, which range from the music school's Philharmonia Orchestra to the legendary, extra-curricular Whiffenpoofs. But it's the graduate school that's considered top notch with Ph.D. degrees in music history, music theory and ethnomusicology - fields for musicians who want to pursue the academic and research sides of the arts. UMass Amherst: The music department at Massachusetts' flagship state university offers terrific concert facilities - including a 2,000-seat concert hall and two smaller venues - and ample performance opportunities via 17 instrumental and six choral ensembles. Its 250 undergrads and roughly 70 grad students pursue degrees in performance, jazz, music composition, and music education. And for students interested in taking additional courses, Amherst is part of the Five College collaboration, which allows students to study at other schools, including Smith and Mount Holyoke, and participate in the Five College Choral and Jazz Festivals. Not every music school is a good fit for everyone, and that's clearly the case with the final two on this list of eight great university music programs. One is a terrific classical music training ground, the other particularly well-suited to jazz. If you're looking at music schools in this part of the country, then you probably already know all about Philadelphia's Curtis and Ohio's Cleveland Institute of Music, two excellent conservatories. But these two music schools are part of larger universities, which gives students a taste of classic college life, as well as superior music instruction. Boyer College of Music and Dance: This music program, which is part of Philadelphia's Temple University, offers classical, opera and vocal training, but it's particularly noteworthy for its jazz studies department, which offers bachelor's degrees in instrumental performance, jazz vocal, and jazz composition and arranging, a major well-suited to the demands of a career as a gigging musician. If your jazz musician ever vied for the prize in the Lincoln Center's annual "Essentially Ellington" high school competition, that's a Temple University-sponsored program. Still looking? Don't discount the West Coast, which is home to some dazzling music conservatories and excellent university programs in California and beyond.